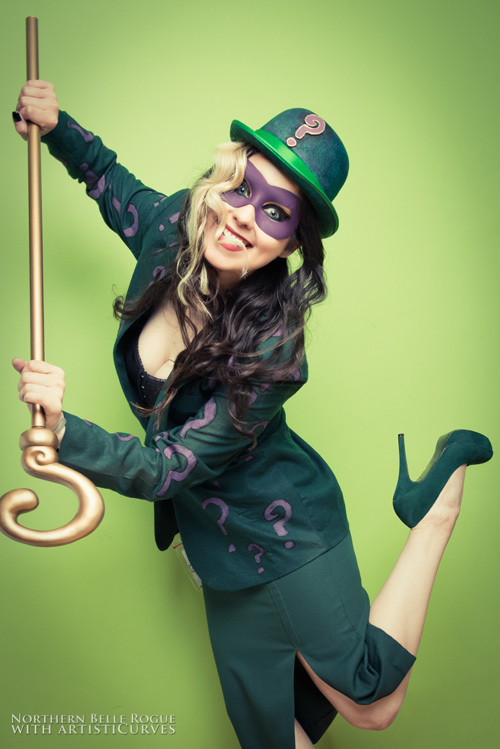 "Riddle me this! What's green and purple and crazy all over? ;) After shooting E. Nygma how could I resist going right off the deep end? This jacket is the same one from the Nygma set, in fact most of the outfit is the same but styled differently. I approached this cosplay from the mind set of what if Ed (Edna) Nygma snapped? How would she make her costume? Rather than opting for spandex or a whole new suit, I figured she would probably make use of what was already lying around, and so I did. I hope you enjoy this quirky set, definitely a fun character I'm going to revisit at some point. Big thank you to ArtistiCurves for shooting the set with me!"